Move your shoulder blades to loosen up your back and burn fat faster through brown fat activation. Build a beautiful body line by strengthening your posture. When you think about work what often comes to mind is the pain you have to bring home with you in your neck in and your back from sitting at a desk all day trying to do your job. At this point you may want to take a pain reliever just to get through the rest of the day or… start moving your shoulder blades. What are exercises I can do to help with my posture? When you want to relive stiff shoulder is doesn't matter where you are. Limiting exercise to the gym is can be a real pain in the back when you schedule and your body demands that you do something about it now. How can I work the kinks out of my shoulders myself? When it comes you improving your posture what's most important is building a strong back. However, not everyone looking to fix their posture is in optimal condition. 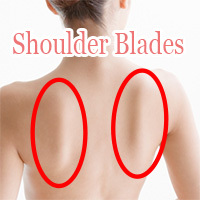 That's why it's advantageous to start at your shoulder blades. People have tried it know it makes a difference and you will too once you give it a try. When dieting and exercise you will be confronted with areas of your body that are not only hard to get but never cross you mind that there may be a problem. Your back is no exception. It is not uncommon to see people bent over standing upas if to that it reflects their age. Standing this way may seem cool at first but if done over a long period of time you become what you do. Have you ever wondered what was going on behind your back? Your tummy and upper arms may be apparent to you, but for others your back is what stands out. Do you want to be mistaken as being older than you really are just because you don't stand up straight? If you don't, it's time to get on it starting by moving your shoulders. There are many factors that go into making a great first impression. Whether you like it are not, the image you give off is spoken for you by your posture. In order to maintain good posture showing a beautiful body line, strengthening your back muscles is a must.How you do this starts by training your scapular muscles. Whether you are typing away on the computer, taking a walk, or just eating lunch turning good back posture into a habit does wonders for strengthening your back without even hitting the gym. Compared to kyphotic posture, good posture helps you burn of more calories. Not only does standing up straight help make a better impress, but maintaining good posture burns of more calories. Removing the knots from your back not only helps you with attaining beautiful body posture, your fixing your posture stimulate muscles in your back burning off tons of calories while relaxing your back. Getting to hard to reach places such as your back can be done by simply paying attention to your posture. Opt to change your physical condition as well as potentially boost your career starts here. Bad posture has a negative impact on your circulation and is said to be the leading cause of why people get stiff shoulders. In particular, computer posture leaning over typing all day long can cause you to become fatigued not to mention the pain in the back it is on your neck. In addition, bad circulation makes it harder to burn fat. Failure to correct your posture has an adverse effect on you circulation and in turn impedes your ability to burn off fat. Just by moving your shoulder blades more is it possible to stimulate the scapular muscles along your back and improve blood circulation in your body. Don't let desk work tie your down. Move your shoulders whenever you are in between things and just need a break. When I say move your shoulders, I don't mean throwing your arms around. Give yourself some space and take it slow avoiding any movement that screams out "That's overkill!" Don't worry there are no rules saying you have to do one hundred before sundown. Something is better than nothing. Bending at the elbows place your arms at your side sticking out your chest. Make a point to bring both of your elbows behind your back tight at the waist. Bring your shoulder blades close together and hold for 3 to 5 seconds. Stretch your arms out in front of your body rounding at your back as to pull your shoulder blades apart. From this position hold for 3 to 5 seconds before resting. By moving your shoulder blades it is possible to build a strong and flexible back. Not only does this help shape up your back; it also gives your body what it needs to burn off more calories. The area around your back is said to contain relatively large amounts of brown fat cells that if activated convert fat into energy, i.e. burn fat. It turns out that this process, thermogenesis of fat cells, is the fastest way your body has when burning off fat. Moving your shoulder blades more often promote strong brown fat activity. Moving your shoulder blades stimulates the muscle along your back allowing you sculpt a beautiful body line by activating brown fat cells to burn off more calories making it easy to keep from gaining weight. What first starts off as overlooking the fat on your back can suddenly make it hard to dress in underwear. As odd as it may sound, the reality of it is that this is one reason why people often have to buy a new pair. It's important to keep in mind what you are doing to help the condition of your back. Whether you are looking to build a beautiful body line by moving your shoulder blades around or you want to burn more fat without hitting the gym, it all starts at your back. So make time to care for you back and you should be just fine. The only 2 shoulder blade exercises you are going to need for work to loosen up your back and burn off fat faster through brown fat activation. It's time to give you're the juice it needs to evaporate fat from your body. Dieting in Japan is not so much about losing weight fast like you would like to believe is possible in a short time frame that allows you to fit into your dress in time. Instead, it's about your lifestyle. Office workers (that's salary man in Japanese) have it tough. Not only is it said that they don't get enough exercise, they are at risk of becoming obese, sitting down in a desk all day. Big companies have already taken this into account and want to see they're employees wearing smaller pants. When it comes how you go about dieting and exercise, you are going to need all the help you can get. However, real people want results without buying expensive equipment that not only takes time away from your day, but takes up space that could be used for bigger and better things. The connection between your shoulder blades and how effective diet and exercise are helping you lose weight and slim down is not so obvious. It turns out that having a rounded back can adversely affect the functionality of your shoulder blades impairing your ability to burn fat. How often are you moving your arms and shoulders around? For people less broken into exercising this amount is not a lot. As easy as it is to concentrate on moving your should blades, you would be surprised how many people don't do it. In particular, people stuck at a desk all day, crunched over like a cat, are prone to the area of their shoulder blades stiffening up. By moving your shoulder, you can make it easy to burn off fat, ease stiff shoulder pain, shape up your back, and fix your posture to get the impressions you deserve. This exercise requires a little more concentration than most exercises you might be used to doing. However, that doesn't mean that with a little practice and elbow grease that you shouldn't be able to get with the program before you can bend over and touch your toes. Raise your arms while continuing to join at your elbows. While you are raising your elbows, concentrate on moving your shoulder blades upward. Move your elbows behind your back, pushing your shoulder blades together. Do these movements imagining that you are pushing the muscles in your back together. Repeat the movements in this exercise 5 times for best results. This next exercise is going to take a little rhythm on your part to get the moves down to expert precision. Once you get the hang of it, it shouldn't take more than a minute to do, just what you need one the way back from the break room. Lightly rest your hands on top of your shoulders. Rotate your arms about your shoulders, drawing circles with your elbows in front of your body. Complete 10 rotations before stopping. Note that while doing this exercise you should concentrate on moving your should blades instead of just your arms. Doing the same movements as in step 2, this time draw circles behind your back. Complete 10 full revolutions and you are done. The reason that you accumulate fat in your body is to store away energy. The notion of burning of fat can also be thought of as accessing energy stored away in your body. There are many ways to do this such as aerobic exercise, dietary restrictions, and cold-induced thermogenesis. The amount of brown fat cells in your body is limited and remains the same since after birth. For newborn babies this makes a big difference, allowing the body to convert baby fat into energy that it can use to heat up the body when it's cold. This works differently than what happens when you shiver. Brown fat cell activation is the fastest way that your body has to access energy stored away as fat. You may be asking how does doing shoulder blade exercises activate brown fat cells. Again, the amount of brown fat cells in your body is limited. Luckily enough, we know where a good portion of it is hiding, in your back. That is why just by doing shoulder blade exercises it is possible to tap into a field of fat burning dreams. Now that you know how to burn off more fat than before, applying science to fit your weight loss goal, what's next? Incorporating should blade exercises into your daily routine a continuing over time, you will not only notice that your shoulders are more flexible, but should appreciate a decrease of fat throughout your body. What is there to lose when you can get work done without getting stiff shoulders and trim fat off your body? Is gravity kicking in on your chest area and you are scrambling for ways not to be pulled down? These are the exercises that can give you the support your bra just can’t with you should-blades. Pilates for shoulders? Frozen shoulder exercises at home help you loosen up those stiff shoulders without leaving your loving room. Looking for new stretches and exercises to spice up your routine? Then you have stumbled upon the list of stretches to improve flexibility. Are you safe from pelvic distortion? If you not sure then you have nothing to lose by picking up pelvic exercise and back stretches to attack you pelvic area. Dance in front of the mirror while brushing your teeth!? That’s easier said than done. Good postures and hip circles will get you flat abs fast. Give it a try! Lurking in the urban jungle are accidents just waiting to happen. That is why even if you have to stick out; exercising precaution at work is a must. Even if you work environment makes it almost impossible to go home feeling a little stiff that doesn't mean that shoulder blade exercises wouldn't help. 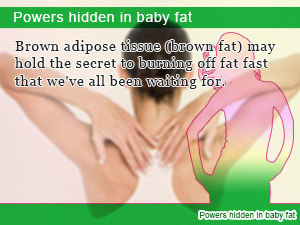 Brown adipose tissue (brown fat) may hold the secret to burning off fat fast that we've all been waiting for. The lines your back makes can make or break how good you look in a dress. Don't abandon your shoulder blades, exercise them. The region pinching your upper back together is a gold mine for weight loss so don't miss your chance to activate brown fat cells. When you need to keep your weight down you are going to need all the help you can get. Exercising your upper back give you the little push you need.